JOHN J. BERIBAK | Charysh & Schroeder, LTD.
John J. Beribak received his Juris Doctor in 1999 from The DePaul University College of Law. While in law school, he was a member of the DePaul Law Review and The DePaul Journal of Health Care Law. He received his Bachelor of Science degree in 1995 from Miami University. 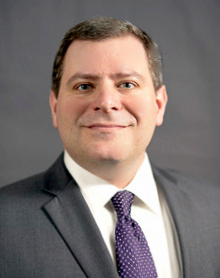 Mr. Beribak is admitted to practice in the State of Illinois, before the United States District Courts for the Northern, Central and Southern Districts of Illinois and the United States Court of Appeals for the Seventh Circuit. Mr. Beribak handles a wide variety of litigation in both state and federal courts. His areas of practice include professional liability defense (including the defense of physicians in medical negligence matters), catastrophic personal injury, construction litigation, product liability, commercial litigation and civil rights. He also has significant experience defending class action lawsuits, employment discrimination claims, trademark infringement suits and consumer fraud actions (including defense of actions involving the Fair Credit Reporting Act and the Fair Debt Collection Practices Act). He has handled mediations and binding arbitrations before federal and state agencies. Recently, Mr. Beribak received a not guilty jury verdict in defense of a physician in a Section 1983 civil rights case. The case was tried before a jury in federal court in Southern Illinois. The jury deliberated for less than two hours before returning a verdict in favor of Mr. Beribak’s client. In another recent jury trial, Mr. Beribak successfully defended an Oklahoma bank in a property damage lawsuit involving government-secured property in Chicago. After the plaintiff rejected the bank’s final settlement offer the matter proceeded to trial in Chicago. The jury deliberated for 1 1/2 hours before returning a verdict in favor of the bank. Mr. Beribak was also part of the trial team that recently secured a total recovery of almost $2 million in a commercial litigation suit on behalf of a manufacturer of food processing equipment. In that case, Charysh & Schroeder brought suit against thirteen of its client’s dealers across the United States for violating a written agreement and purchasing illicit counterfeit parts for its machines. The trial team received a verdict in favor of its client that included an award of attorneys fees and costs.